(Nanowerk News) If you thought scanning one of those strange, square QR codes with your phone was somewhat advanced, hold on to your seat. Researchers at the University of California, Los Angeles (UCLA) have recently developed a device that can turn any smartphone into a DNA-scanning fluorescent microscope. "A single DNA molecule, once stretched, is about two nanometers in width," said Aydogan Ozcan, HHMI Chancellor Professor, UCLA. "For perspective, that makes DNA about 50,000 times thinner than a human hair. Currently, imaging single DNA molecules requires bulky, expensive optical microscopy tools, which are mostly confined to advanced laboratory settings. In comparison, the components for my device are significantly less expensive." Enter Ozcan's smartphone attachment -- an external lens, thin-film interference filter, miniature dovetail stage mount for making fine alignments, and a laser diode, all enclosed in a small, 3D-printed case and integrated to act just like a fluorescence microscope. Although other smart-phone-turned-microscopes can image larger scale objects such as cells, Ozcan's group's latest mobile-phone optical attachment is the first to image and size the slim strand of a single DNA molecule. The device is intended for use in remote laboratory settings to diagnose various types of cancers and nervous system disorders, such as Alzheimer's, as well as detect drug resistance in infectious diseases. To use the camera it is necessary to first isolate and label the desired DNA with fluorescent tags. Ozcan says such laboratory procedures are possible even in remote locations and resource-limited settings. To scan the DNA, the group developed a computational interface and Windows smart application running on the same smart phone. The scanned information is then sent to a remote server in Ozcan's laboratory, which measures the length of the DNA molecules. Assuming you have a reliable data connection, the entire data processing takes less than 10 seconds. In their lab, Ozcan's group tested the device's accuracy by imaging fluorescently labeled and stretched DNA segments. It reliably sized DNA segments of 10,000 base pairs or longer. (A base pair is the basic structural unit of DNA.) Many important genes fall in this size range, including a bacterial gene notorious for giving Staphylococcus aureus and other bacteria antibiotic resistance that is about 14,000 base pairs long. The smartphone microscope demonstrated a significant drop in accuracy for 5,000 base-pair or shorter segments, however, due to the reduced detection signal-to-noise ratio and contrast for such short fragments. The problem could easily be remedied by replacing the device's current lens with one of a higher numerical aperture, Ozcan said. 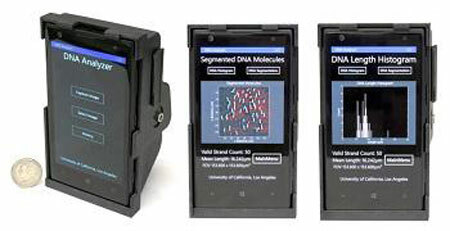 In addition to its use in point-of-care diagnostics, Ozcan proposes that his platform could also be useful for differentiating high molecular weight DNA fragments, which are problematic for conventional gel electrophoresis, a frequently used technique in biochemistry and molecular biology to size DNA and RNA fragments. Ozcan's group next plans to test their device in the field to detect the presence of malaria-related drug resistance. The presentation, "Field-Portable Smartphone Microscopy Platform for Wide-field Imaging and Sizing of Single DNA molecules," by Qingshan Wei, Wei Luo, Samuel Chiang, Tara Kappel, Crystal Mejia, Derek Tseng, Raymond Yan Lok Chan, Eddie Yan, Hangfei Qi, Faizan Shabbir, Haydar Ozkan, Steve Feng, Aydogan Ozcan, will take place from 16:30 - 18:30, Thursday, 14 May 2015, in meeting room 212 A/C, San Jose Convention Center, San Jose, California, USA.